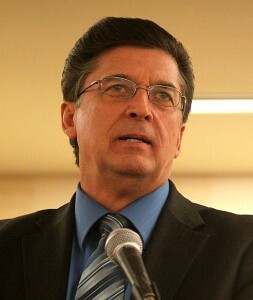 Richard Mack, the former sheriff of Graham County, Ariz., and an antigovernment “Patriot” movement figure who leads the Constitutional Sheriffs and Peace Officers Association, has a long history of promoting the theory that county sheriffs, not federal law enforcement, represent the supreme law of the land. This radically decentralized vision of government was first promoted by the old far-right Posse Comitatus movement. Mack shot from obscurity to right-wing stardom in the mid-1990s when he challenged the Brady Handgun Violence Prevention Act and won a victory in the U.S. Supreme Court that weakened the law. For the past two years, he has zigzagged across the country spreading conspiracy theories about the federal government and promoting his organization as a “line in the sand” against government agents. Fox Business channel’s Lou Dobbs Tonight gave Mack a platform to promote his views last night. Lou Dobbs, of course, is no stranger to controversy. Mack did not disappoint, telling Dobbs that in order to “save America”, county sheriffs need to refuse to obey federal gun laws. He hinted, as he often does, that civil war might result if they fail to do so. Mack is calling on sheriffs in Vermont to refuse to enforce the laws: "Sheriffs have a constitutional duty to refuse to comply with such ordinances. We're seeing sheriffs in New York oppose the Safe Act and Gov. Cuomo. If we have sheriffs in New York doing this, how much more should we have sheriffs doing it in Vermont?" MACK: Well, we want the borders protected. They ignore the immigration laws, and they do pick and choose quite often. But we don’t want to pick and choose. We want the Constitution enforced by those in local and municipal jurisdictions who swore an oath to do just that. And so this really is a badge vs. the badge situation, and I believe that the biggest badge in the county is the county sheriff. The county sheriff is the only elected law enforcement officer in the county. He reports directly to the people, he’s not a bureaucrat, he doesn’t answer to other bureaucrats. If we’re going to take America back, then we must do so one county at a time, sheriff by sheriff. Dobbs never bothered to ask Mack how he could argue for local control while trying to undermine local control in Burlington. That would be too much to expect.